Handful of fresh dill, depending on how much you like, cut fine. 3 eggs, beaten. Village eggs are better than the supermarket ones. Heat a bit of olive oil in a large saucepan and cook the onions and leek until translucent, about 2-3 minutes. Add the spinach and wait until the leaves wilt and the liquid has cooked off, about 8-10 minutes. Remove the pan from the heat and allow to cool a bit. When cool enough to handle, finely chop the spinach and place in a large bowl. Lightly oil (always use olive oil!) a 12 inch diameter metal baking pan (you can use a larger baking pan – you will just have a thinner pita, but don’t use a smaller one or the pieces will be too fat! ), or a 10 x 15 inch rectangular baking pan. Mix the dill and feta cheese into the spinach. Add salt and pepper to taste (careful with the salt – the feta will add quite a bit of its own). Pour the eggs over and give a stir to combine well. Open up the fylo pastry and place on a work surface. Layer half of the fylo in the pan, brushing each layer generously with olive oil. Let the edges to hang over the sides of the pan. Repeat layering with the remaining fylo, oiling each sheet generously. Bake the pie in the middle of the oven for approximately 40-45 minutes until it is golden brown. For the last 15-20 minutes, I put my baking pan directly on the oven floor to crisp it better. Cool till just warm. Cut into serving pieces and serve either just warm or at room temperature. 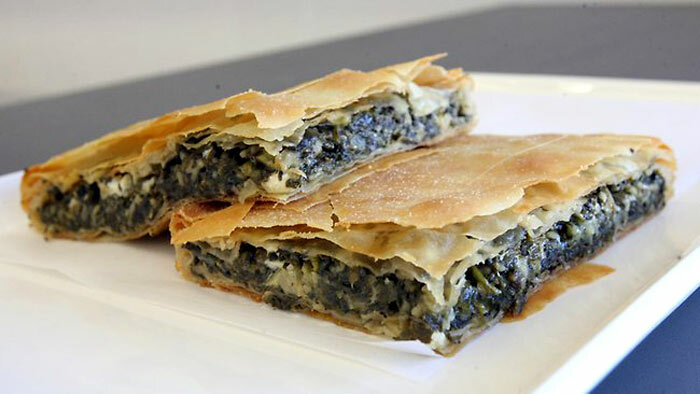 Note: If my spinach filling appears to be too ‘wet’, I often take 2 of the fylo sheets and use them as a ‘layer’ between the spinach filling; these sheets absorb the extra liquid (they must not be brushed with oil). Make sure you put it out of sight before dinner or your family will eat it all! Look s a yummy recipe; I’ll have a go.